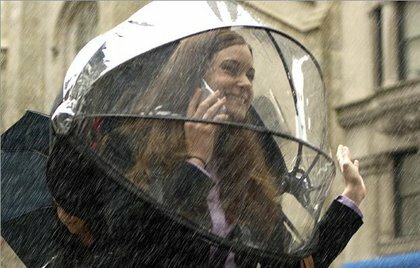 Here’s a prime example of a product solving a first-world problem: Phone-Brella lets you text and hold the umbrella at the same time. 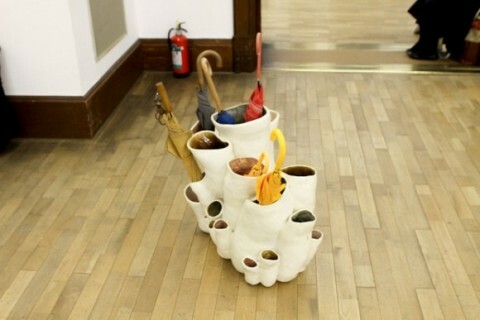 I noticed this interestingly shaped umbrella stand over on this Spoon & Tamago post covering this year’s senior thesis exhibition of the Kyoto City University of Arts in Japan. Can anyone tell me the name of the student that created this piece? I’d love to add it to the post. 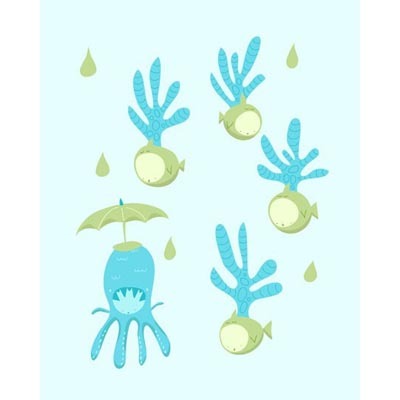 My reader Bjerg made my day by pointing me to these Goggles Umbrellas. If this product doesn’t have a built-in happy factor, I don’t know what does. Totally wishlisted. Now, if only I could figure out how to order from this site. 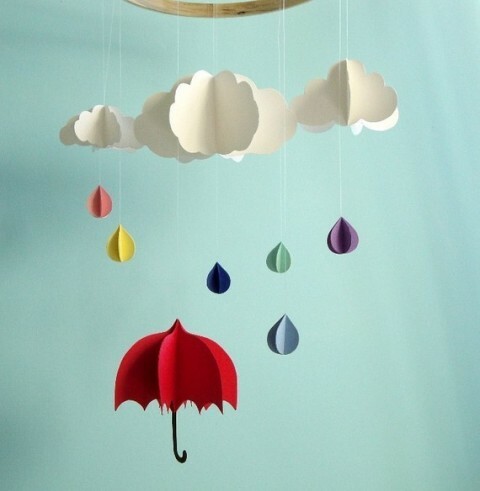 Clouds and Umbrellas make me happy. 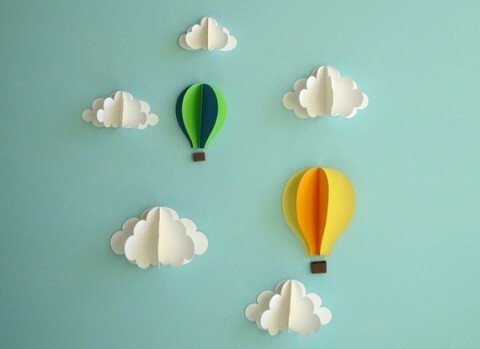 Considering that one of Ella’s walls is light blue, these wall clouds would look amazing. Dave and Fabian of Holstee fought the rain this morning and came to visit me at swissmiss studio. As they were walking in I noticed Dave’s supercool umbrella. 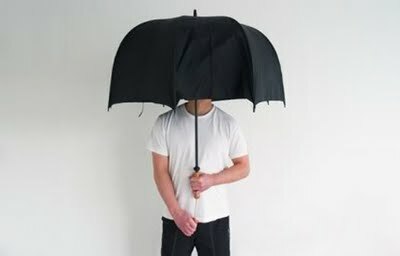 Knowing how careful they select products they own, I wasn’t surprised to hear that this was a fully biodegradable umbrella. And yes, it’s available in their shop. 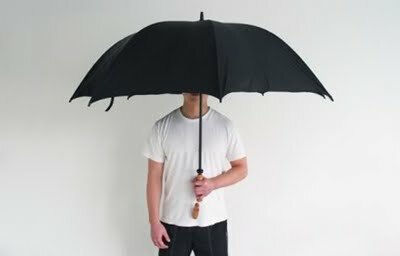 Anyone who’s been in NYC after a storm has seen it – the streets and trash cans are filled with the super cheap black umbrellas, destined to sit in our landfills for hundreds of years. 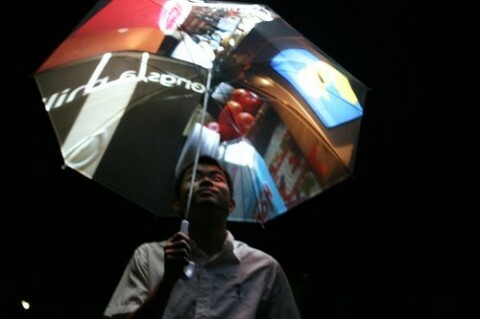 This is the worlds first fully biodegradable umbrella. It is made of 3 materials bamboo, organic cotton and a patented biodegradable bio film. 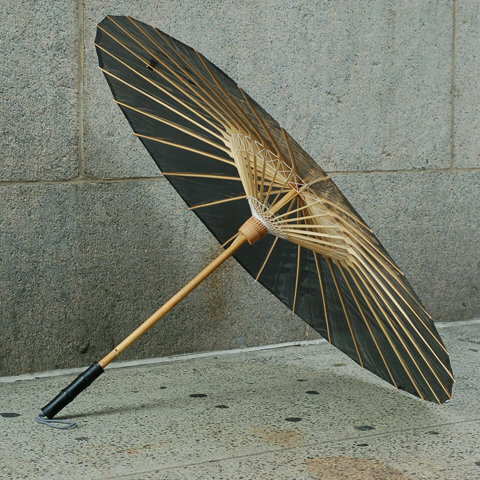 It’s great to look at, but don’t be fooled, it is designed to withstand winds up to 40 mph – common street umbrellas will barely make it past 12mph. This is for you G! 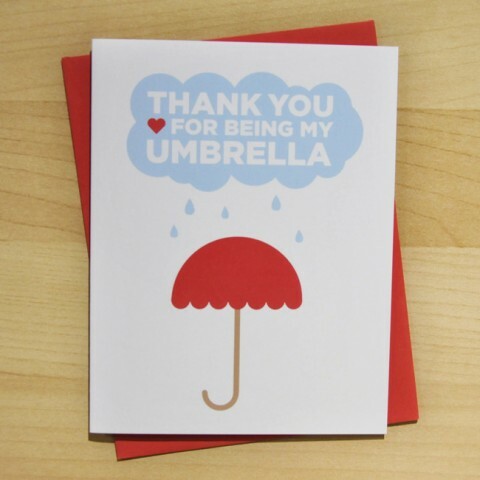 Hey G: Thank You for being my Umbrella! 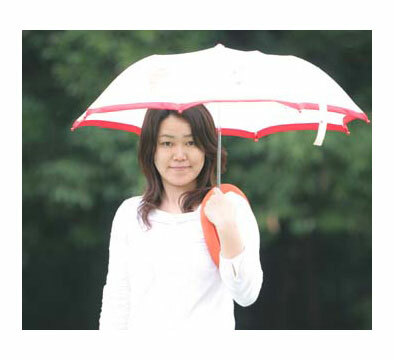 The Polite Umbrella folds up when you squeeze past people on the sidewalk. Watch a video over on JooYoun Paek’s site. 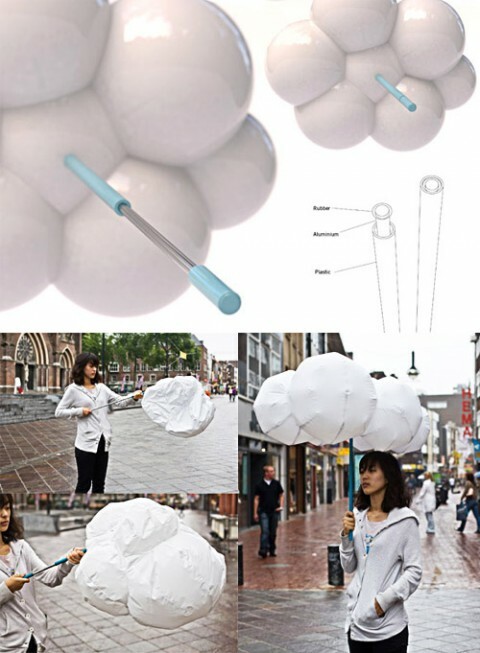 Created by Dutch designer Joonsoo Kim, the Cloud Umbrella is carried around in stick form, and then inflated into mini-cumulus clouds of protection when the rain starts to pour. Made me smile and want one. on the verge of tears, originally uploaded Marta V.
UPDATE: I got an email from the inventor of the FUN-O-Meter. His name is Jake Bronstein. Check out more about his idea here. 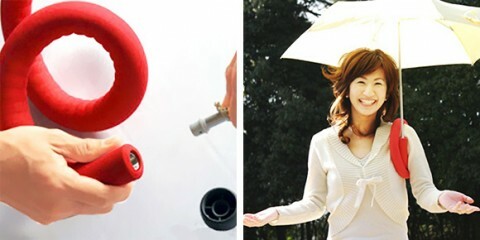 This unique, funnel shaped umbrella harnesses the flow of rainwater down into its handle, a water pistol. The user can fire at will, maintaining a constant flow of water as long as rain continues to fall! 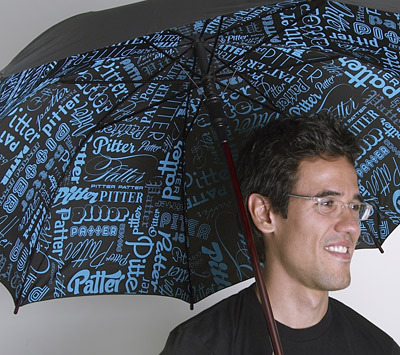 Splashed with more than 80 typefaces from Veer’s Umbrella type collection, the Pitter Patter umbrella shields you from cloudbursts with a burst of typography. 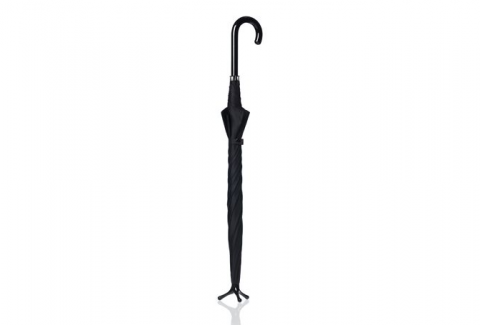 Set in blue type on eight panels of black fabric, with a wooden handle and automatic release. 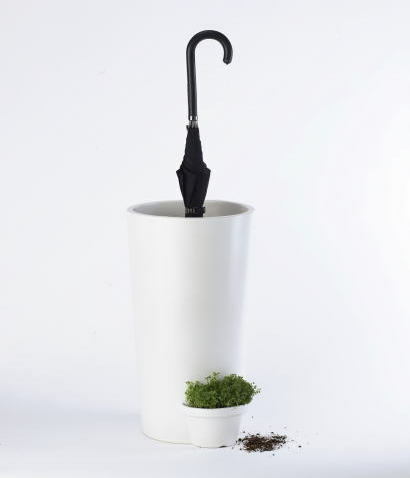 The umbrella pot is an ingenious invention as the collecting rainwater actually serves a purpose: watering the plant. I *love* it! 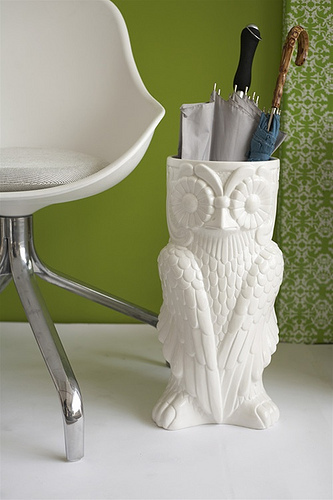 “Milo” – Milo is rain-o-phobic, so he carries an umbrella with him at all times. 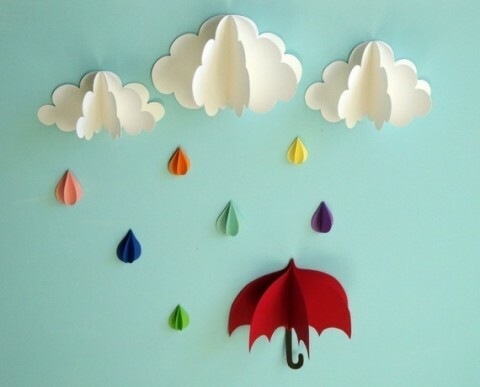 Color Wheel Umbrella : I think it’s time for me to introduce a new category: Umbrellas. Right G? 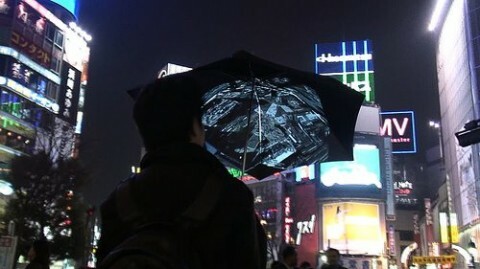 Pileus is an umbrella connected to the Internet to make walking in rainy days fun. Pileus has a large screen on the top surface, a built-in camera, a motion sensor, GPS, and a digital compass, and it provides two main functions; A Social Photo-sharing and A 3D Map Navigation. The photo function is connected to a major web service “Flickr”. 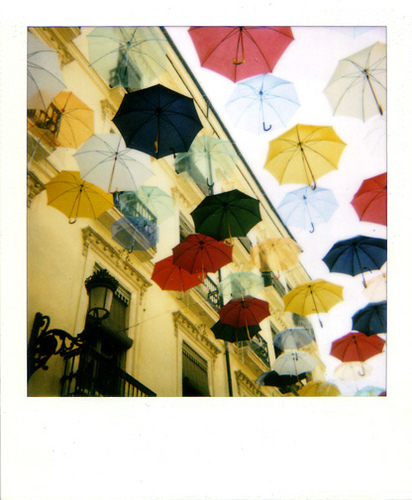 A user can take photo with a camera on the umbrella, and pictures are uploaded to Flickr in two minutes with context tags via a wireless Internet connection. Users can also enjoy themselves watching photo-streams downloaded from Flickr …with simple operation of wrist snapping. 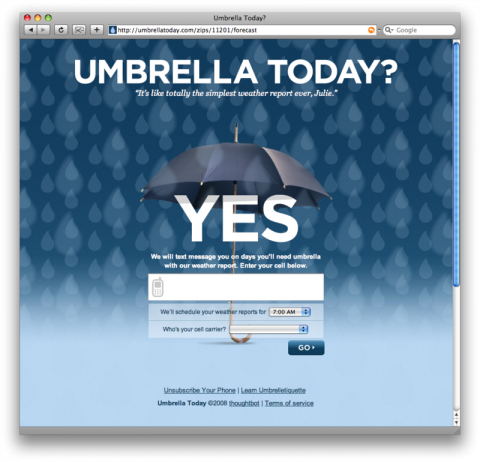 Pileus: The Internet Umbrella. Made for you, G! 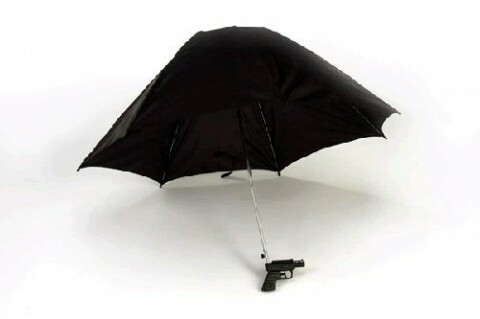 This stand umbrella had me rejoice and grin. Fabulous!